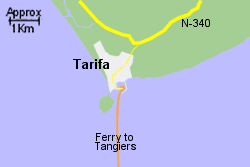 Map of the Tarifa Ferry Port area. The small ferry port of Tarifa is located at the town of Tarifa, just 20Km further west than Algeciras on the most southerly point of Spain, but a shorter crossing, just 15km from the north coast of Morocco, and 30 km from Tangier. The N340 trunk road which is just over 1Km from the port gives good connections along the coast, joining the A-7 a little further east. 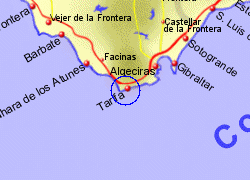 There are regular bus service east and west from Tarifa. 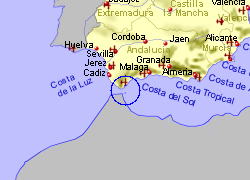 The nearest train station is at Algeciras. 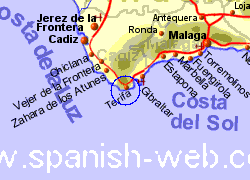 Gibraltar airport is approximately 30km from Tarifa. Operated by FRS with 6 crossings per day, crossing time approximately 1hr. Also operated by Intershipping, 6 crossings per day, crossing time 1hr.